C, B & B – cables, bobbles and blackberries. These are the key stitches used. 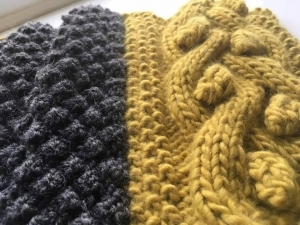 This cabled scarf is all about texture. The heavy chunky cables at the ends are worked first and add weight to the aran blackberry stitch in the main scarf. The construction is unusual but this is fast, easy knitting.